KI Media: In case you are curious, here's the actual story behind Hem Keth Dara's shortlived "Nationalist Movement"
In case you are curious, here's the actual story behind Hem Keth Dara's shortlived "Nationalist Movement"
By Arnold R. Isaacs (1983), JHU Press. The illusion of joyous reconciliation was fostered, briefly, when a contingent of black-clad soldiers marched down Phnom Penh’s Monivong Boulevard early on the morning of the 17th to take the surrender of the armor and infantry soldiers near the Hotel Le Phnom. After the government troops put down their weapons, they were smilingly told to go home. Civilians nearby began embracing and crying with joy, joined by the black-clad uniformed arrivals. Those not too elated to notice such things, however, quickly realized that these men were too clean, too neatly dressed, and too untired to be front-line troops. 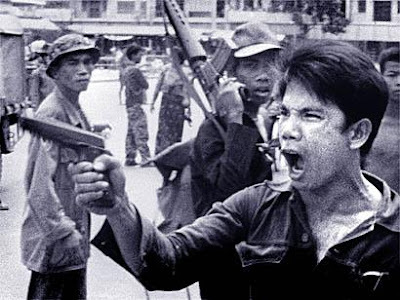 In fact, they were not Khmer Rouge soldiers at all but Phnom Penh students, led a general’s son named Hem Keth Data, whose bizarre attempt to take power before the Khmer Rouge arrived was apparently undertaken on behalf of the perpetually scheming Lon Non. In the confusion of the day Keth Dara succeeded a little later in taking control of the government radio station, announcing himself in a four-minute broadcast as head of the “Nationalist Movement.” His followers he called “younger brothers” who had seized Phnom Penh in order “to allow elder brothers from outside” – presumably the Khmer Rouge – to enter the city without fighting. a High Ranking officer of Khmer republic regime.He was one of prince Sisowath Sirimatak group. Thank to KI to solve this mystery. I'm the same with 8:42 PM. I've seen this photo in various media throughout my life and each time the captions would simply say, "Khmer Rouge soldier taking over Phnom Penh". He looks too clean to be a Khmer Rouge combatant. Now I finally know the truth behind this photo. He looks more like Youn's soldier. it's the infamous photo of khmer rough evacuating people out of p.p. what happened to this guy? where is he now? Hem Keth Sana is vavin his pistol in an attempt to sopt the looters ranscking the those chinese shops. those idiots western writter, like ben keirnan etc, after switching side from the KR defender to defender another faction of kr/hun sen clan, stated the pistol waving guy was a kr solder threatening people to leave the th4e city. Sana was a lon non's scam sent out assist his srender with hope he Non would get something out of the kr as pot and samphorn were exclassmates. what non had from the kr was his head off the his shoulder. his head was seen a fence of the phar thmey market soon after his surender. Hem Ket Sana was a high official of the government and also the President of the Natioanl Administration school. He created the "Movement National" by getting the direct direction from HM Norodom Sihanouk. The goal of the "Movement National" is to convince all intellectuals and officials of the goverment not to flee the country. 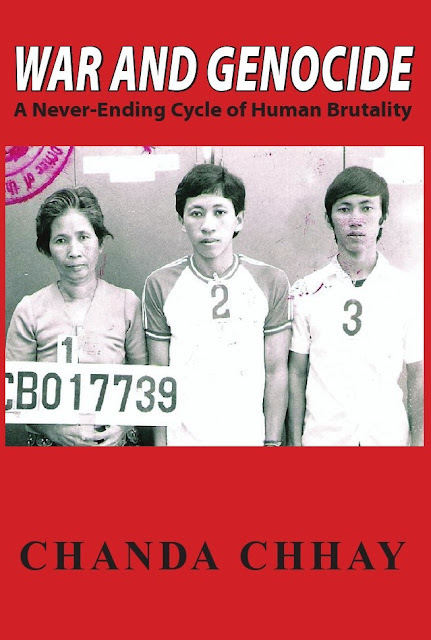 The "Monatio" convinced everyboby that everything will be Okay when the khmer rouge take over because Monatio has connection with Sihanouk. People believed Monatio and did not flee the country. 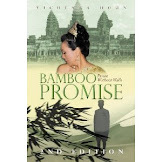 That was the work of HM Sihanouk with the cooperation of the Khmer Rouge. Objective was to keep all intellectuals in the country and kill them. That is the true story. Monatio was not a work of some reckless youngs. It was a well calculated maneuver prepared by the Khmer Rouge with the cooperation of HM Sihanouk. Hem Ket Sana was just a tool used by them.